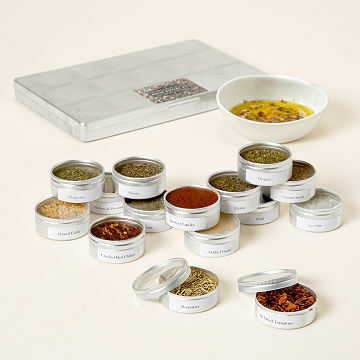 Dip into 15 different flavors with this set of spice blends. Dip into the flavors of the four corners of the world. These 15 spice blends by Julie Pedersen let you explore the core flavors of five different cuisines. Start your journey in France with herbs de Provence, tour Italy with oregano and crushed red pepper flakes, dash over to Spain with a pinch of smoked paprika, then zip to Morocco with za'atar. Try one of the recipes and bread pairings included under the lid, or liven up your party spread by creating your own worldly blends. Assembled in Canada. Pair your Gourmet Oil Dipping Spice Kit with our Pure Extra Virgin Olive Oil. The recipes are easy, fun to make, and the end result is delicious! The tastes take you to a faraway place, without having to leave home. Oil Dipping Sauce is perfect vegan gift! A very practical pantry item. This made a great gift for the hard-to-buy-for friend who loves to eat and bakes her own bread. I do worry about freshness with dried herbs and these didn't look particularly better than what I would find in a grocery store, but the combination of 'recipes' is fun. An adventure for the taste buds! Mainly for dinner and dinner parties. My husband and daughter loved being able to experiment with different flavor combinations.